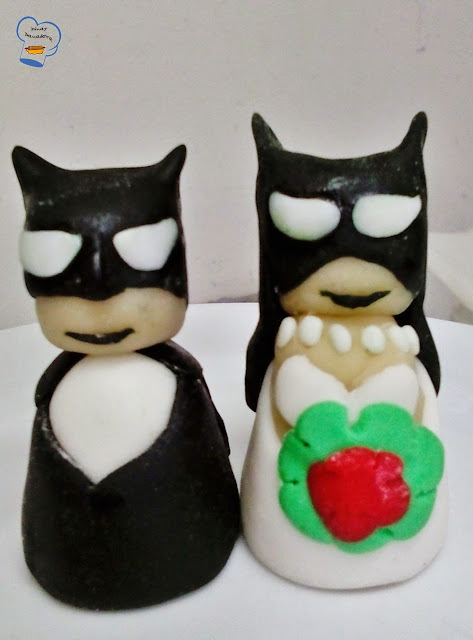 A June bride wants Batman and Batwoman cake topper for her wedding next month. She sent a picture and inquired if the baker ( which is me) could sculpt the hero and his bride just like how they look in the picture. My boss asked if I could give it a go. That was difficult but I tried anyway. She took a picture of it once it's done and sent it to the bride. I don't have strong background in figure sculpting. I used the little experience I have to model the body and face. The eyes were difficult but I managed to make them look decent. The figurines are not perfect. Well, it's the best I can do. This is only a trial, anyway.